New! Options/NET 11.0 - now lets you analyze Iron Condors, Butterflys, Calendar Spreads, Straddles, Ratio Write Spreads, Calendar Puts, Strangles and more. Options/NET is designed for option traders to enable them price options, estimate historical and implied volatility, as well as to estimate the greeks. The latest version of Options/NET is suitable for quants (quantitative analysts), brokers, investment banks, option traders and others writing trading systems who wish to develop software for fast option pricing trading systems. Look how easy it is to build your own application to analyze Iron Condors, Butterflys, Calendar Spreads, Straddles, Ratio Write Spreads, Calendar Puts, Strangles and more. Profit-Loss Chart produced from Options/NET outputs. Options/NET 11.0 introduces powerful new functionality for computing the profit and loss ranges for multi-leg option positions. This new version allows you to quickly assess the total position, greeks, break-even points and more. Our new system of analyzing multi-leg options is so flexible and powerful, that you can even create your own position, even if nobody else has thought of a name for it! Simply enter the position details for each "leg" of the option position and let our software compute the details. and more using Options/X or Options/NET. Full souce code demo is provided. 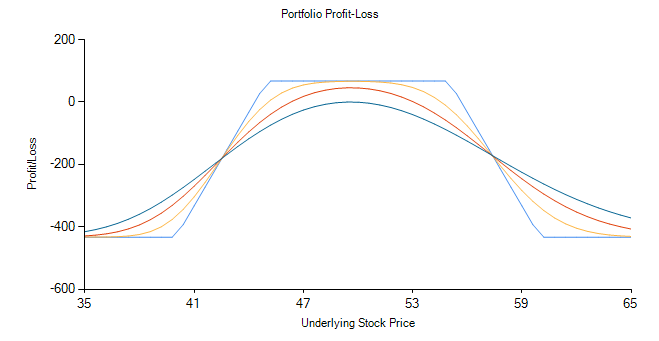 This component includes methods to compute probabilities relating to profits, upper and lower profit bounds, maximum profits, maximum losses, and the expected maximum profits or losses within the supplied ranges, profit ranges and the percentage moves required to break-even. Our software includes a high level of support - we want you to be fully satisfied with our software to do the thing you want to do. The demos we provide are easy to understand and are the first step to creating your own applications. Extensive software documentation is included to use the full library of API calls. 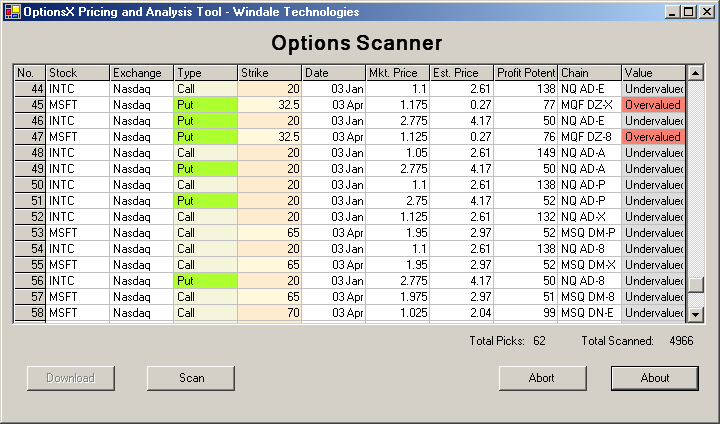 Create your own options scanner - this options scanning software program was built in just a short time using Options/NET and Visual Basic .NET (Note that this application is not included with Options/NET, it is just used to show what can be done). Options/NET gives you the power to easily create your own trading system, option price calculator, implied volatility estimator and more. Risk-Reward methods to compute potential risk and reward for option trades. Options/NET gives you the power to easily create your own trading system, option price calculator, implied volatility estimator and more. With our easy to use, yet powerful software, including demo applications with source code, backed up by our top notch support, you will be able to build applications to price stock options, commodities and currencies in minutes, not days. Options/NET is very fast, yet easy to use. In only one line of code, you can add derivative pricing to your application. If you are looking for an Excel Add-In, you may be interested in Options/X Excel Add-In. 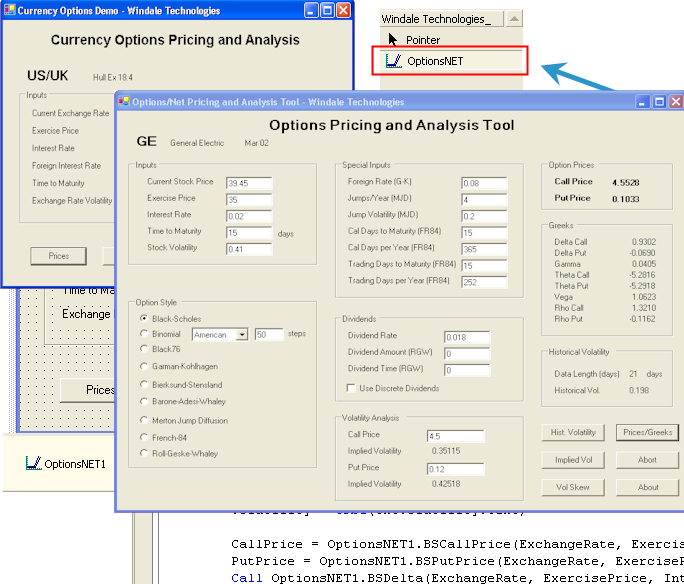 Both Options/NET and Options/X include full sample source code, and SDKs to create options pricing calculators and option trading applications in Visual Basic, Visual C++, Visual C# and more. You can compute greeks, implied and historical volatility to value put and call derivatives for American and European options using the Black-Scholes formula, Binomial Cox-Ross-Rubenstein model and others. 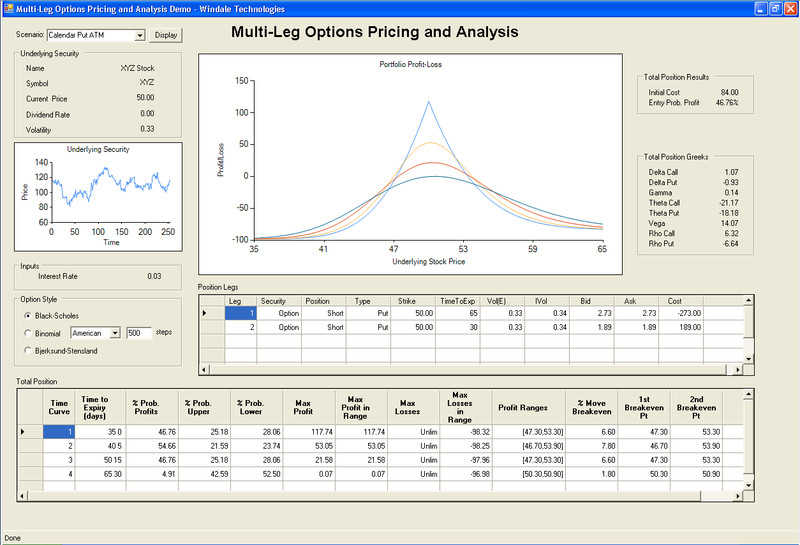 A free 90 day trial can be downloaded here: Options/NET Options Pricing Software. With our easy to use, yet powerful software, including demo applications with source code, backed up by our top notch support, you will be able to build applications to price stock options, commodities and currencies in minutes, not days. Use Options/NET to calculate Option prices for European and American Options, analyse options sensitivities or compute implied volatility. Use our example program or develop your own Windows applications for option trading easily in: Visual Basic .NET, Visual C#. WIth the Enterprise version you can create an ASP.NET web site and call any of the option pricing methods within your web application. Now with Patent-Pending Technology for faster implied volatility calculations! With full source samples you will be able to quickly and easily implement Options Trading software. Download Options/NET now and you can try it out in full, even compile programs using the trial version. Using implied volatility analysis, compute the volatility smile. Find the "greeks" - Delta, Gamma, Theta, Vega, Rho. Dividend earnings as a percentage yield can also be included. European and American options can be analyzed using the Black-Scholes option pricing formula, Binomial options pricing methods (Cox-Ross-Rubinstein), Black method for futures or any of the other methods listed below. Now, to compute the option prices and greeks, you could look up issues such as how to compute the standard normal cumulative distribution function and a set of equations to program. Or, we suggest - simply try our well-proven options pricing software. With Options/NET we provide the full source code for creating an ASP.NET options pricing calculator web application. Click here to try Options-Pricer ASP.NET Sample Application. Full source for this web application is provided with Options/NET. These option pricing algorithms provide a method of determining the call and put prices for European and American options, greeks, implied volatility and volatility skew for both call and put options is also available. If you are aiming to develop an option trading system for the stock market, try Options/NET, a .NET DLL that enables you to quickly build your own system. With the addition of stock quotes, you can create your own option trading software, customized to your own purposes. Options/NET includes sample applications with source code in Visual Basic .NET as a Windows application and as a Web application. You can quickly see just how easy it is to price and analyse data using Options/NET. Options/NET Control implements option pricing and analysis functions. For each of the pricing models, the implied volatility and volatility skew for both call and put options can be determined. Screen shot of an application built in Visual Basic using Options/NET. Options/NET includes sample applications with source code in Visual Basic .Net. 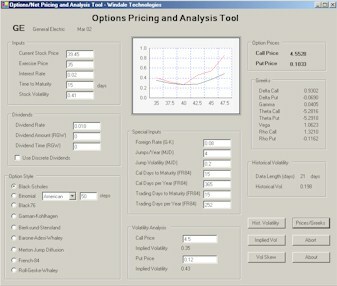 You can quickly see just how easy it is to price and analyse options data using Options/NET. Options/NET is strong named, so it can be readily added to the GAC (Global Assembly Cache). Options/NET is written in C# with maximum speed and reliability and can be used in a wide range of applications that support the .NET standard. This includes Visual Basic .NET, Visual C# and more. The trial version of Options/NET is feature limited: you will only be able to access Black-Scholes functions using the trial version. However it is possible to develop trial applications to test out your ideas. If you need to price American Options using the Binomial model (Cox-Ross-Rubenstein), or do futures pricing, then by purchasing the full version you can obtain the full capability. The Black-Scholes option pricing formula can be used to compute the prices of Put and Call options, based on the current stock price, the exercise price of the stock at some future date, the risk-free interest rate, and the standard deviation of the log of the stock price returns (the volatility). A number of assumptions are made when using the Black-Scholes formula. These include: the stock price has a lognormal distribution, there are no taxes, transaction costs, short sales are permitted and trading is continuous and frictionless, there is no arbitrage, the stock price dynamics are given by a geometric Brownian motion and the interest rate is risk-free for all amounts borrowed or lent. It is possible to take dividend rates for the security into consideration. American options differ from European options by the fact that they can be exercised prior to the expiry date. This means that the Black-Scholes option pricing formula is not suitable for this type of option. Instead, the Cox-Ross-Rubinstein Binomial pricing algorithm is preferred. 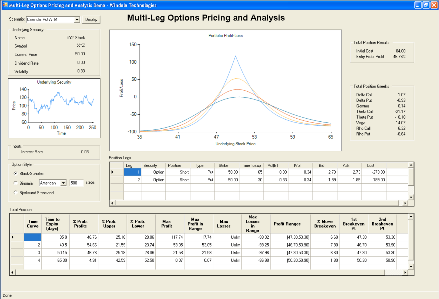 optionsnet implements the binomial pricing algorithm for pricing American options. used to compute the prices of Put and Call options, based on the current stock price, the exercise price of the stock at some future date, the risk-free interest rate, the standard deviation of the log of the stock price returns (the volatility), and if applicable, the dividend rate. Given the option price, it is possible to find the volatility implied by that price. This is known as the Implied Volatility and it has a number of characteristics which have been used to identify trading opportunities. optionsnet implements implied volatility functionality for both American and European options using the Binomial and Black-Scholes methods respectively. Implied volatility can be computed for both puts and calls across a range of different strike prices. Interestingly, it is common for the implied volatility to vary across this range. Plotting the implied volatility against the strike price results in a curve that is termed the 'volatility smile'. This is due to the fact that it is common for out of the money calls and puts to have higher implied volatilities. When there is a difference between the implied volatilities using equal out of the money calls and puts, this is termed the 'volatility skew'. Interpretation of the skew is the basis for some trading activities. If the ratio of Call volatility to Put volatility is considered, a value greater than one may imply that the calls are priced higher than puts with a resulting upward price bias and vice versa, ie. a call to put volatility ratio less than one may imply that calls are priced lower than puts with a resulting downward price bias. High skew ratios may indicate demand increasing for puts, ie there are relatively more puts being bought and calls being sold, than puts being sold and calls being bought. The analysis and interpretation of volatility skew should be undertaken with due care and diligence and is a matter for skilled, professional traders. F. Black and M. Scholes, The Pricing of Options and Corporate Liabilities, Political Economy, Vol 81, May-June, pp. 637-654. J.C. Hull, "Options, Futures, and other Derivative Securities", Second Edition, Prentice-Hall: Englewood Cliffs, 1993. Futures and options trading involve substantial risk. The valuation of futures and options may fluctuate, and as a result, clients may lose more than their original investment. In no event should the content presented on this web site, associated links, files and software, help documentation and related information provided by us, the results obtained from using software provided by us, or the content of the source code sample applications be construed as an express or an implied guarantee by Windale Technologies that you will profit or that losses can or will be limited in any manner whatsoever. Past results are no indication of future performance. Information provided is intended solely for informative purposes and is obtained from sources believed to be reliable. Information is in no way guaranteed. No guarantee of any kind is implied or possible where projections of future conditions are attempted. This software is for sophisticated users in terms of both trading options and in programming. Users are required to be familiar with the limitations of the algorithms used. It is therefore up to the developer and/or end-user to determine how, when and the appropriateness of a model and the results obtained using a model. In particular, developers are required to assume this risk when using the software and should similarly pass on the assumed risk and information about such risks to the end-user so that they can make their own best judgements. Windale Technologies specifically recommends that the software is not used in any form of automatic trading or decision making applications, bur rather, it should only be used in an application that requires the user to make any trading decisions. Windale Technologies is neither an investment advisory service nor an investment advisor. All information provided by any means does not take into account your personal situation and is therefore not personalized in any way and should not be construed as investment advice. Investors should always check with their financial advisor to determine the suitability of any trading or investment decision.